Technical analysis is a powerful tool to help forecast price moves. Technical analysis is all about studying past price changes in order to forecast future price movements. In this article we will introduce the different chart types and then explain in detail how trend indicators and price action can be used to analyze and build forecasts of future prices. There are three main technical analysis chart types that are widely used. Candlestick charts were originally conceptualized in Japan by rice traders and was brought to the Western world only recently. The Candlestick charts are distinctive in their look and they show a lot more information than any of the other chart types. A typical candlestick chart shows the open, close, high and low prices for the day or the session. Depending on how prices close, the candlesticks can be red or black (when the price closes below the opening price) or white/green (when the price closes above the opening price). When prices close and open at the same price level, it is known as a doji. The open and close prices are represented by the body of the candlesticks whereas the high and low are the wicks. Candlestick charts are important as they can represent the market sentiment. For example, a bullish candlestick (close > open) shows that there are more buyers in the market and such prices are likely to continue to move higher. Similarly, a bearish candlestick shows that there are more sellers in the markets and therefore, prices could continue to fall. When the opening price is equal to or close to the closing prices, it results in a doji candlestick which shows indecision in the markets. Bar or Open/High/Low/Close (OHLC) charts are similar to Candlestick charts, except that prices are represented as bars and not as candlesticks. Bar charts are useful as they are primarily used to look for price highs and lows in the market. Bar charts are an ideal tool when utilizing price action techniques such as drawing trend lines or to identify highs and lows in a trend. Line charts are the simplest of all three chart types. The line chart simply tracks the closing prices plotted as a continuous line. Line charts are ideal for more advanced users and can be used to identify recurring chart patterns as well as in understanding trends in the market. Line charts track only closing prices as they are considered to be the most important data point. Prices move in trends, in uptrends or downtrends. An uptrend is defined as a series of price movements which form higher lows and higher highs, surpassing the highs from the previous waves. A downtrend is where prices make lower lows compared to the previous lows while also making lower highs. The chart below shows the two types of trends that are formed in the markets. When there is no trend, or when no new highs or lows are being established, the markets are said to be trading sideways. Trends form an essential element when it comes to chart analysis. Without knowing what the underlying trend is, it would be difficult to predict prices. Trends are formed across all time frames, monthly, weekly, daily and down to intraday time frames such as 15 or 30 minute intervals. When analyzing charts, it is always a good practice to look at the trend in the higher time frame such as the daily and weekly in order to understand the market context and anticipate where prices might be heading next. Technical indicators such as moving averages, Bollinger Bands and oscillators are widely used in forecasting prices. When using technical indicators, traders should note that there is a lag in the development of price changes and thus the technical signals that are taken based off the indicators. This lag is due to the fact that all indicators are based on price (it could be High/Low/Close/Open) and these price levels are added to the indicators only when the particular session is closed. The chart below illustrates the above points. In the above chart, when utilizing price action alone, we can see that after the asset’s price posted a double bottom, it broke the next resistance level near 1084 and then dropped back to establish support. This was an early price indicator of a change in trend. The resulting rally then saw the previous resistance high at 1184.3 being broken, which was a second confirmation. In comparison to the price action, the 200 and 50 period moving averages, which are trend indicators, showed a bullish crossover rather late and only when prices rallied to 1226.21, a significant rally off the initial confirmation at 1084, followed by a second confirmation at 1184.3, showing the lag in the indicators. When using technical indicators, the following different types of indicators help in better analysis of prices. Technical indicators which show trends on the chart are the starting point of any analysis. Trend indicators such as moving averages and Parabolic SAR help the trader to visualize trends on the chart. Of the various trend indicators, moving averages such as the 200, 100 and 50-day moving averages are widely used, plotted on a daily chart. Depending on how the short and long term moving averages line up and where present prices are in relation to those lines, traders can see price trends and are thus able to better forecast future price moves. Volatility indicators are used to show when prices are likely to move strongly in a direction. When combined with trend indicators, volatility indicators can help traders to understand when they can expect to see a trend strengthen or when a new trend will be established. Of the many volatility indicators, Bollinger Bands are the most widely used as they can help the trader to not only visualize trends but also volatility. Typically when volatility increases, the established trend is considered to be strong when prices move in the direction of the trend. Volatility indicators also help traders recognize when prices are moving sideways or trending in one direction or another. Momentum indicators are used to predict when prices are likely to correct or when a trend is likely to change. In an established trend, momentum helps traders to know when prices are likely to continue in the same direction. Although similar to volatility, momentum is known to lead price. Rising momentum indicates a continuation of the trend while falling momentum hints at a potential slowdown in prices. Momentum and volatility go hand in hand as when volatility increases, momentum starts to build up accordingly. The chart below, shows the trend (50-day moving average), volatility (Bollinger Bands) and momentum (RSI at the bottom) indicators which build a complete picture of the market being analyzed. Price action technical analysis is also known as trading without any help of technical indicators. Price action is a bit more complex as it requires traders to understand some of the key concepts. The basis for price action trading is of course, support and resistance based on which all other forms of price action based analysis is formed. Support and Resistance, also known as Supply/Demand are price levels on the chart where prices are likely to have a high probability of reversing. The support and resistance levels can be either horizontal levels or trend lines which are formed by connecting highs or lows in prices. These levels can be identified by looking at past price reaction at these levels. A support level is where there is more demand, and therefore prices are likely to reverse and move higher. A resistance level is where there is more supply, and thus prices are likely to decline lower. The next chart below shows horizontal support and resistance levels. Unlike the horizontal support and resistance levels, there are also dynamic support/resistance levels that are formed. These are identified by plotting trend lines. A rising trend line signals dynamic support levels and is drawn by connecting consecutive higher lows in price. A rising trend line usually occurs within an uptrend. A falling trend line signals dynamic resistance levels and is drawn by connecting consecutive lower highs in price. A falling trend line forms in a downtrend. Trading with chart patterns requires a strong understanding of support and resistance levels and trend lines as almost all the chart patterns are formed out of these two essential elements. The chart below shows a quick outline of these patterns. Candlestick patterns are another way to understand what the markets are doing. The candlestick patterns are limited only to candlestick charts and signal the market sentiment for the short term. 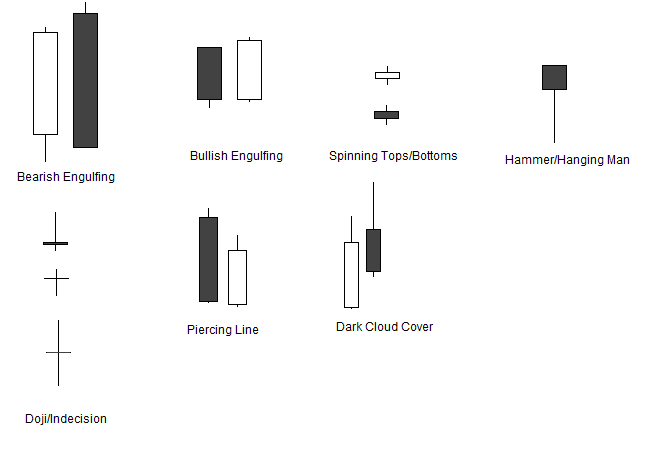 Candlestick patterns come in various shapes and they show whether the buyers or the sellers are dominant. While there are many types of candlestick patterns, the following are the most important. There is no right way to analyze price charts, and each of the methods outlined in this article comes with its own pros and cons. Some traders feel comfortable using technical indicators to forecast prices, while others make use of price action techniques to arrive at their conclusion. The big difference however is that technical indicators are often lagging in nature. This is because almost all technical indicators are based on closing prices, which means that there is a certain lag (one session lag). Also due to this lag, technical indicators are often delayed in showing trend changes or turning points in price, but when they do show the changes, they are usually well confirmed. It is also important to note that technical analysis is more risky when used without taking into consideration the fundamental factors influencing the markets. Always make sure to understand the near term fundamentals of the markets in order to build the context before delving into technical analysis.